Alaska is not the most obvious of holiday destinations. You might expect an inhospitable climate and general lack of creature comforts, and it is a long way from England. However, it proved to be one of our best ever holidays. The summer weather is changeable, much like it is at home, but three rainy days and nine sunny ones is pretty good. Daytime temperatures varied from just above freezing in Barrow to the high twenties Centigrade in Fairbanks. The hotels are excellent, because the state relies heavily on tourism, and we were made very welcome everywhere. 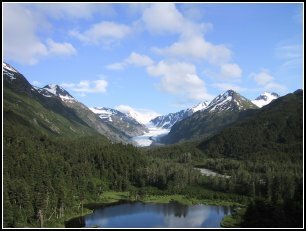 But best of all Alaska is largely uninhabited, offering the adventurous traveller a unique opportunity to observe all the grandeur of nature in the raw. Truly the world's last frontier. We began in Anchorage, not the state capital but nevertheless home to two thirds of its population. Our first observations were few high buildings (earthquake zone), lots of light aircraft (more pilots per head than anywhere else), not many cars (mostly 4x4s) and the rarity of indigenous Alaskans (most people are just up for the summer). 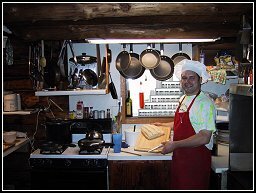 The food is good, but expensive by US standards because almost nothing is grown locally. The tourist routes are well established, if you can find them, but blissfully uncrowded. In the next couple of weeks we drove our hire car 1,500 miles on three of the four main highways, travelled by dog sled, train, boat, helicopter and countless planes of all ages and sizes to catch a brief glimpse of Alaska's wonders before it withdrew behind the veil of winter. Alaska has four seasons: almost winter, winter, still winter and the tourist season. 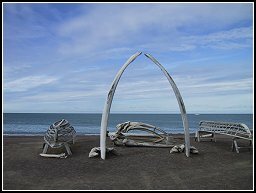 Our northerly itinerary was from Seward via Girdwood, Denali Park and Fairbanks to Barrow; then south back to Fairbanks, on to Valdez and the Chugach Mountains before returning to Anchorage. 'Report to Girdwood station thirty minutes before your train departs' were our instructions. 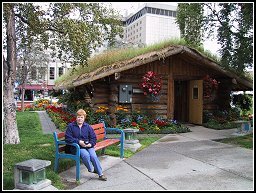 After much searching the station turned out to be a small unmanned wooden structure, much like a garden shed, beside the single track Alaska Railroad. The three hour ride through the Kenai mountains to Seward was worth it. In Seward we took a boat trip through the Kenai fjords where we saw sea otters, whales, sea lions and bald eagles as well as the amazing Aialik Glacier. This glacier held us all spellbound during the thirty minutes silence requested by the captain, as it creaked and groaned and calved huge chunks of ice into the sea. After a night at the winter ski resort of Girdwood we headed north on the Parks Highway armed with 'The Milepost', a telephone directory sized guide to the main roads detailing everything from fuel stops to lookout points. This enabled us to spend an enchanting couple of hours at a husky farm and find a small diner serving the best (and cheapest!) steak we had in Alaska. The journey to Denali gave us spectacular views of the Alaskan range of mountains, but almost left us stranded when one of the rare fuel stations we were relying on proved to be out of petrol. 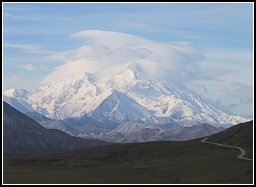 Denali is an enormous national wildlife park and home to the highest mountain in North America, Mount McKinley, aka Denali - the Great One. Access is only via an approved coach tour; no other vehicles are allowed. Following local advice we opted for the first tour of the day, departing at 5.30 am! As all sled dogs know, 'if you ain't number one the view never changes'! In the next eight hours we saw an impressive sample of animals and birds, including our main objective - bears, and The Mountain showed itself for the first time in a month. I can confirm from close first hand experience that bears do in fact sh** in the tundra. Next morning we took a helicopter ride through the mountains to a high glacier, without doubt one of the most exciting experiences of our travels. To rise up one side of a saddleback mountain, swoop over the sharp ridge and see a panorama of untouched grandeur before you is simply breathtaking. 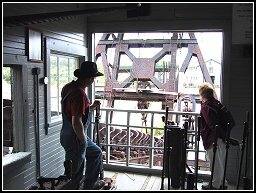 Fairbanks, our next port of call, is an old gold rush town right in the middle of the state. It was surprisingly warm while we were there (27°C), and gave us the opportunity to observe and practise how gold was won from the paydirt. We also had a close look at the Trans Alaska pipeline which transports hot crude over 800 miles from Prudoe Bay in the north to the ice-free port of Valdez in the south. Returning from a restaurant at midnight the sun was still shining! 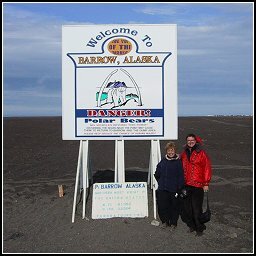 No trip to Alaska would be complete without visiting the Arctic Circle - so we took a day trip to Barrow, the northernmost settlement on the continent and barely 1,000 miles from the North Pole. Travelling over 600 miles from Fairbanks in an Alaska Airlines 737 seemed routine enough, but looking down at the total desolation below was a salutary experience. The informality of the airline was illustrated when the cabin staff informed us that 'passengers caught smoking would be invited to sit on the wing for their own personal showing of ‘Gone With The Wind’'! Barrow is an unlikely mixture of the sophisticated and the primitive, but a powerful tribute to man's battle with the elements. Fifty cable TV channels but no tarmac roads. A modern swimming pool which doubles as a fireman's reservoir (try putting out a fire with ice!). A well equipped hospital with a refrigerated basement (good salesman I guess!) to prevent it melting the permafrost and sinking. The Inupiat people were delightful, with their own special culture and social behaviour ever ready to catch you out. They still hunt whales for personal use in the traditional way, but use cellphones to summon their friends to help retrieve and butcher the catch. The supermarket was fearfully expensive as airfreight costs a dollar a pound, unless you wait for the annual two month window when barges can unload on the beach. No gardens and the cemetery is definitely seasonal, because the permafrost is like rock. We had a great lunch at Pepe's but no alcohol - the town is 'damp': possession is legal but sale is not. For me the best symbol of the contradictory life in Barrow is the town buses. They all have GPS positioning equipment on board, and a map showing their locations is continuously viewable on TV. Why? - because waiting at the bus stop you might freeze to death or be eaten by a polar bear! Going from a hot summer's day to icy temperatures and back again in short order makes it hard to plan your wardrobe. The following day was spent mostly in the car, as we followed the oil pipeline south for 370 miles across two mountain ranges to the southern port of Valdez. Despite the oil terminal and infamous oil spillage it is very picturesque, a good example of how tourism and commerce can successfully coexist. 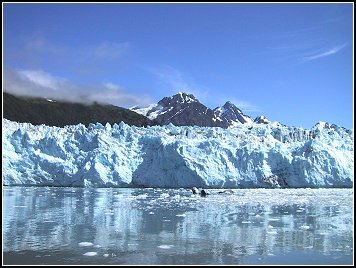 We chose a boat tour around Prince William Sound, with more dramatic glaciers and engaging wildlife and the bonus of a fantastic meal on Growler Island. At dinner in our hotel we watched the sea otters play in the harbour, close enough to distinguish their individual personalities. Our return to Anchorage through the Chugach Mountains took us from rain and snow to bright sunshine at least a dozen times, illustrating just how dangerous travel here can be, even in summer. You may think that having travelled the full circle we would be content quietly to enjoy the delights of Anchorage before returning home. Not so! After an evening flight over Prince William Sound and the Chugach Mountains in a 1944 DC3 we spent our final day seeking bears. An early flight to Kenai in a light twin, followed by another across the water in an even lighter single engine plane took us to the Bear Camp at Lake Clark. 'Camp' is a relative term. The landing was on a sloping beach accessible only at low tide. The accommodation was basic and the toilet (just the one) deep. 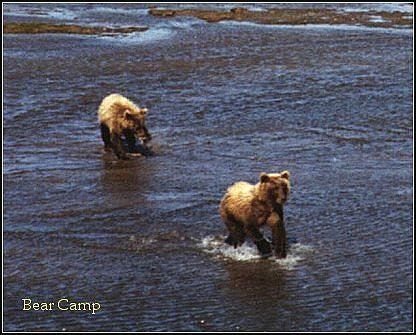 Bears had visited the previous night, one walking through the camp while others had a sleep-in beneath the observation platform. After a safety briefing from our armed ranger (we Brits are not used to the overt display of firearms) we made our way through the woods to the observation platform to wait for bears. We got lucky. Two three year-old twins decided to catch salmon in the river right in front of us. For over an hour they fished, fought over the spoils, chased shadows and generally put on a display for the four of us. It was captivating. What a wonderful way to finish a great holiday.